Download compiled binary for Mac OS X (Intel) and Windows. 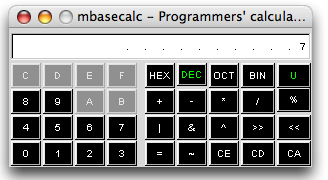 mbasecalc is a clone of basecalc that comes with Xlib Programming Manual from O'Reilly as an example of X library programming. I work on Windows and Macs as well where X is not always available. So I wrote this one. I hope you'll find it useful too. 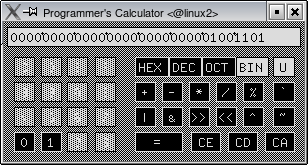 A free cross platform toolkit (written in C++) called FLTK (Fast Light ToolKit) is used in order to make mbasecalc run in Linux/Unix, Mac OS X and Windows. You can get it from http://fltk.org/. I play with almost all freely available cross platform toolkits, I find fltk is the cleanest (and very fast) of all. And most of all, lots of fun to code with. I'm not a fan of GUI builders but FLTK has a gui builder called FLUID (Fast Light User Interface Design) which I actually can use. Please visit my fluid_hack page. You need to download source if you you are on Linux/Unix (as well as the fltk). You can download and use the compiled binary for Mac OS X (on Intel) and Windows. Download and install fltk first. If you find the program useful, please let me know. Bug reports, suggestions are always welcome. 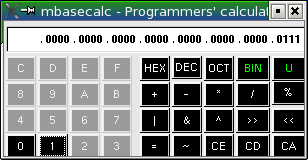 Thanks to Adrian Nye for writing basecalc in Xlib Programming Manual. 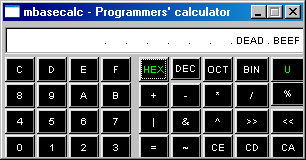 I borrowed lots of code from basecalc. Added configure script to Generate Makefile. Colors on 2 buttons were not correct. Compiled on my Intel MacBook running Mac OS X 10.4.8. Thanks to Frank Jennings for providing binary for Mac OS X PowerPC.